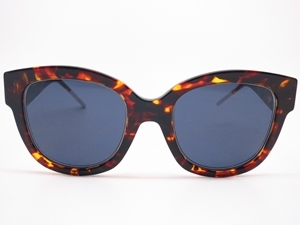 THE DIOR VERY DIOR 1N IS A LARGE ANGULAR FRAME WITH WIDE CANNAGE PATTERNED TEMPLES. THE FRAME ALSO FEATURES A METAL END THE FRAME IS PART OF A SEASONAL RUNWAY COLLECTION AND IS A DISTINCT HEAVY ACETATE DESIGN. Dior sunglasses are covered by the 12 month no quibble sendoptics guarantee.